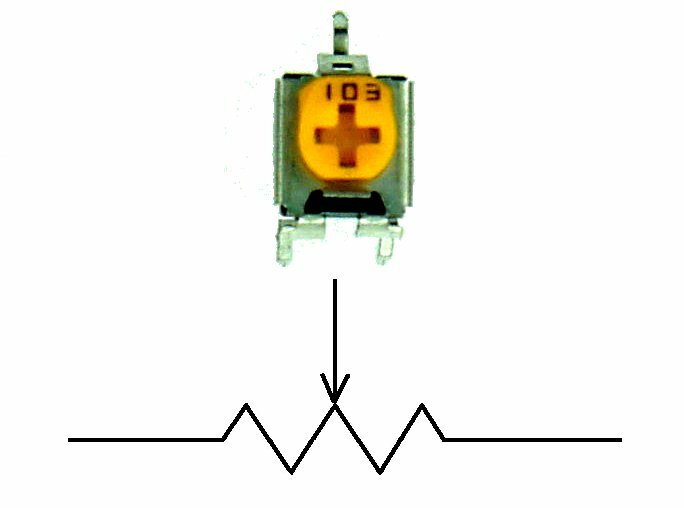 Resistors are not polarity sensitive unless you need to worry about the direction of change on a variable unit. Actually that is not really a polarity problem, just an orientation problem. Resistors may be marked with numeric values, but most often they will simply be banded with colors to indicate their value. That probably is the most prevelent cause of frustration, as some colors may be very difficult to distinguish from others. This can be especially difficult if you get resistors from different places. One manufacturers orange may be very close to another one's red or brown. Once you learn the color code (which basicly follows the colors of the rainbow with some extras at each end) you still need to figure out which end to start reading from. Some resistors will have a wider space between one of the end bands and the rest of the bands. In the example following (fig.1) there is a greater space between the black and gold bands. If this is the case, then the space goes to the right when you are reading the value. Gold or silver is never used for the first two bands, so if there is a gold or silver end band it will always be the tolerance, and face to the right. For 2% resistors the tolerance (last) band is red, so you must take extra care to observe the spacing of the bands. One percent tolerance resistors have 5 bands and the last one (following the space) will be brown. If there are only 3 bands, then you have a 20% tolerance resistor, and the code starts from the band closest to the end of the resistor. Resistor values very commonly use the notation of "K" to mean 1000, and M to mean 1,000,000. A 1000 ohm resistor will be refered to as a 1K resistor. A 1,500,000 ohm resistor will be called a 1.5M (or megohm) resister. a. Brown, black, red, space, gold. Translating you get "1 - 0 - 2 - 5%" which means 10 plus 2 zeros (x 100) or 1000 ohms, equal 1K. b. Yellow, violet, black, space, gold. "4 - 7 - 0 - 5%" This is 47 plus 0 zeros, (x 0) or simply 47 ohms. c. Blue, grey, gold, space, gold. "6 - 8 - .1 - 5%" This time we have 68 x .1 (gold) which is 6.8 ohms. In this next example (fig 2.) all the bands are equally spaced, but they are all close to one end of the resistor. If this is the case, then you start reading from the band closest to one end. Here is another example (fig 3. )that has a wide space between the last band and the rest. In this top view (Fig 4.) I have bent out the terminals to be visible. Normally they are under the pot. In this example, turning the pot clockwise moves the wiper to the right in the schematic. The numbers corespond to the numeric values of the color code. This example's value is "103" or 10 followed by three zeros, or 10K ohm. If the imprinting had said "10K" or "1.5M" or "50ohm", then it would be the actual value.